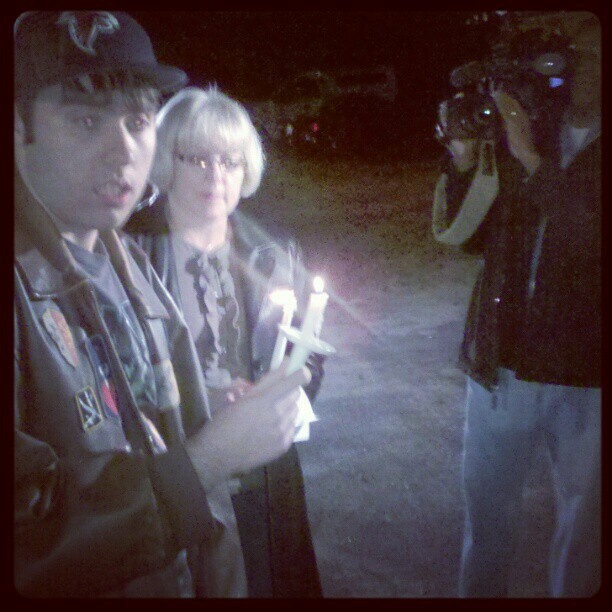 "We aren't going to be held hostage anymore by these proceedings," said owner Marilyn Peterson. It was truly beautiful to experience Parkwood Farms in full effect. The eyes of children light up as they stepped out of their parents cars and towards the horses they've all built important bonds with. 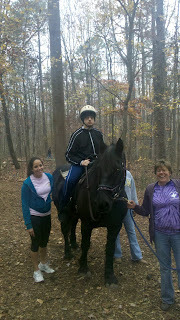 The horses even seemed excited, all the volunteers tell me the horses are kind of spoiled at Parkwoods. 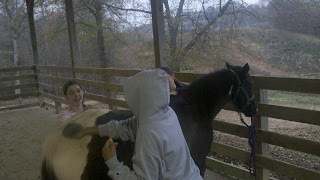 Watching the volunteers, the children, parents, and horses interact in became clear to me what folks are fighting for. 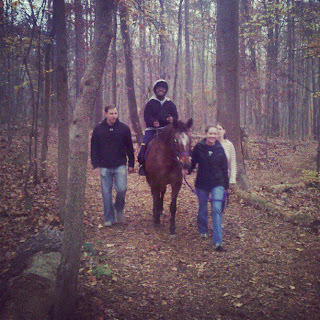 Parkwood Farms is a truly transformative community. A space where children who struggle with disabilities can find refugee with each other and these amazing animals, a space where parents can share the struggles and triumphs of parenthood, a space where volunteers can give their most precious resource, their time, to something they believe in. There was a joy of resistance in the air today at Parkwoods, that's the only way I can describe it. Folks were aware that the farm is legally still under threat of eviction and that reopening the Park is an act of civil disobedience, yet the farm was busy all afternoon with children who missed a week of therapy and were eager to spend time with their favorite horse. Yesterday Peterson and a group of supporters traveled to Atlanta to visit the law offices of Shapiro and Swertfeger, a group that represents the mortgage and lending industry and specializes in foreclosures. In fact, they win awards every year for their high level of success in moving foreclosures and evictions forward quickly. The goal was simple - put a face to the names behind the court case. The group held large copies of photographs of special needs students at the farm, winning medals and caring for the horses, telling their stories to whoever would listen. 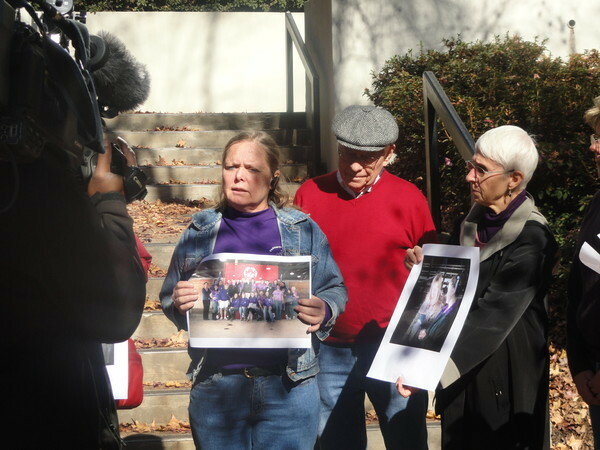 "This picture is of the Special Olympics team," she told members of the media outside the law offices of Shapiro and Swertfeger, displaying a picture of her students. "We take a team every year to the state games. We just want to make sure that this company understands that an eviction would put us out of business, and we wouldn't be able to provide these services to all these people." At this point HSBC and Everyhomes has expressed a willingness to negotiate, something they have never done before. So far there has been nothing but lip service seemed aimed at stopping more bad press and bad will flowing toward their banks. We will see how things develop. We've learned the hard way that until the ink drys a banks word is work nothing. Today, it was just lovely to see smiling beautiful children riding horses at Parkwood Farms. 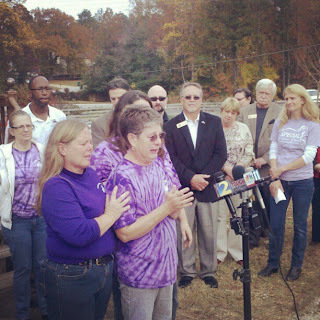 Today parents, volunteers, and supporters of Snellville's Parkwood Farms made a surprise visit to the office of Shapiro & Swertferger at 2872 Woodcock Boulevard Atlanta, GA 30341. 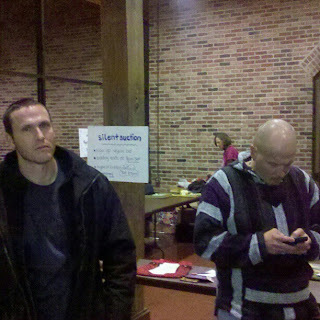 Shapiro & Swertferger are part of a national network of foreclosure mills orchestrated by attorney Gerald M. Shapiro. Mr. Shapiro has lent his name and network to firms in at least 28 states to profit off of the foreclosure crisis by providing services to banks wishing to foreclose and evict. In Georgia foreclosing law firms are often one of the only points of contact between a resident and their bank. The parents of children who used to receive therapy at Parkwood Farms entered Shapiro & Swertferger's Atlanta office sharing their children's stories to pressure Shapiro & Swertferger into getting HSBC and Everbank to talk. They also gave the law firm employees a look at what their paperwork does to communities, small businesses, and families. Upon exiting the building employees of Parkwood Farms made the announcement that they will be re-opening the Farm for children tomorrow at 3pm regardless of whether the threat of eviction was lifted or not. 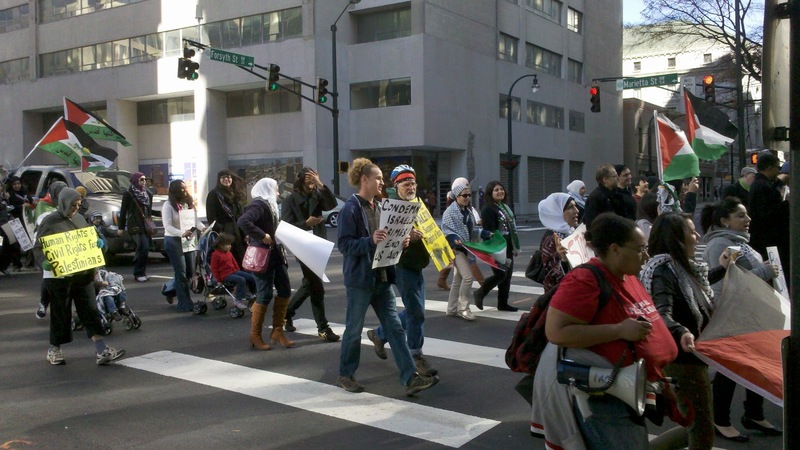 Today , November 24th hundreds of people gathered at Woodruff Park and marched to the CNN Center in protest of the ongoing Israeli attacks on Gaza. 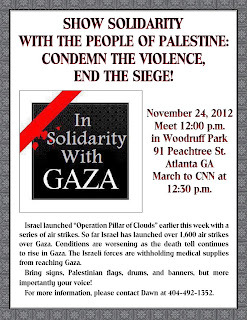 Movement to End Israeli Apartheid-Georgia (MEIA-G) has called on people of conscience to gather to demand that the US government end all military, financial and political support to Israel until it ends the occupation of Palestine and dismantles its apartheid system. The 1.7 million people in Gaza are living in an open-air prison, denied many of their most basic rights, including the right to adequate food and clean water, housing, and sanitation, by Israel, a military superpower, enforcing a blockade that the U.N. has deemed to be illegal. In this most recent assault on the besieged Gaza Strip, Israel has launched over 1600 air strikes killing at least 162 Palestinians. The threat of continued air assaults and ground invasion still remain after Israel killed another Palestinian just hours after an agreed ceasefire. "Israel's most recent act attacks are a strong reminder that we must engage in and intensify broad-based boycotts, divestment initiatives, and sanction campaigns to expose and sever United States' ties to Israel until it recognizes Palestinians' inalienable right to self-determination," said Aysha Abdullatif. The global tide of public opinion has turned against the Israeli government as a result of their brutal 2009 bombardment of Gaza, their attack on the international freedom flotillas, and the human rights violation resulting from the siege of Gaza. The tide has yet to reach the United States. 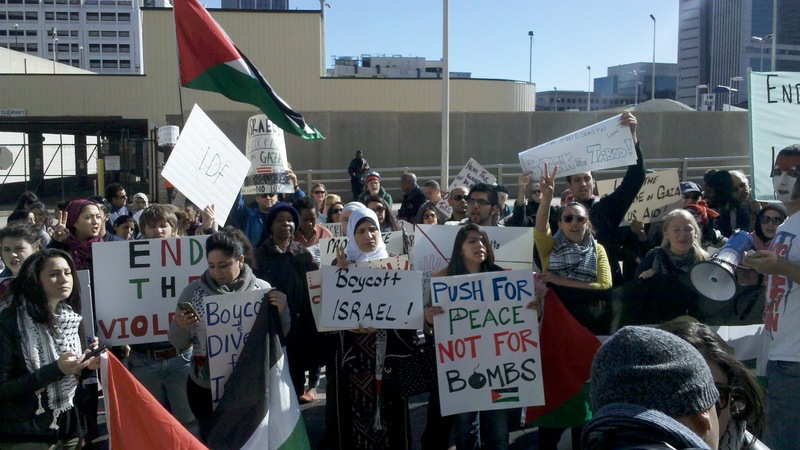 The United States continues to give 10 million dollars a day in military aid to the Israeli government, and many of the F16's that drop bombs on Gaza are made in the metro area Lockheed Martin. It is safe to say that the Israeli governments human rights violations and war crimes are made possibly by our own government. 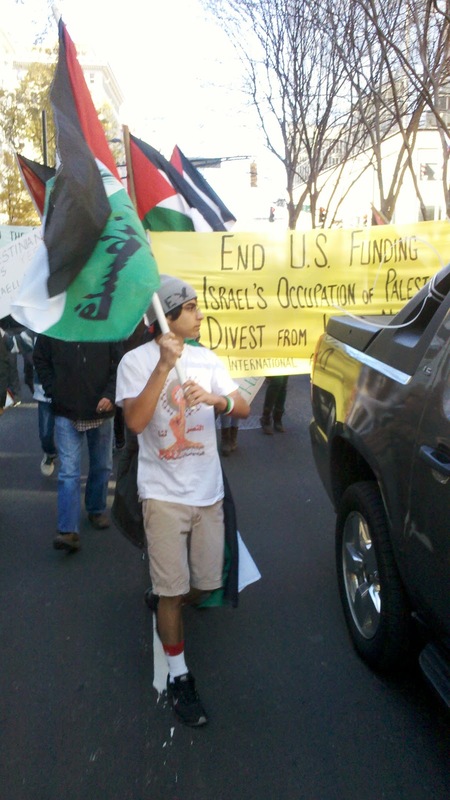 Without our military support Israel might be forced to negotiated a real peace. Movement to End Israeli Apartheid-Georgia (MEIA-G) is an Atlanta-based group dedicated to the global campaign of Boycott, Divestment and Sanctions (BDS) of Israel until it abides by international law and human rights. 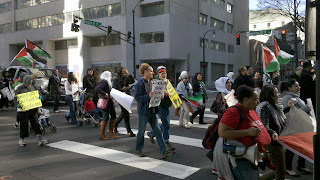 MEIA-G mobilized thousands in January 2009 in the streets of Atlanta to protest Israel's massacre against the Palestinians in Gaza. American Friends Service Committee played an important role in developing the MEIA-G network, and we're excited to work with MEIA-G moving forward. 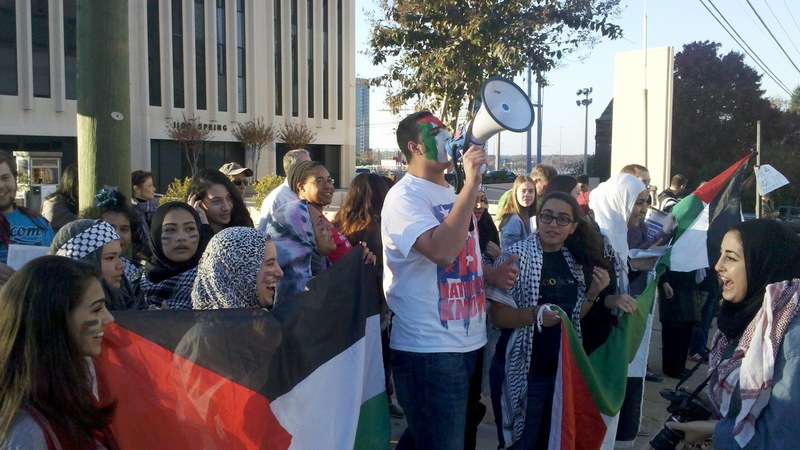 We are collecting stories from Palestinians whose lives are affected by the current conflict. We will continue to add more voices as our staff and partners in the region are able to collect and share more. 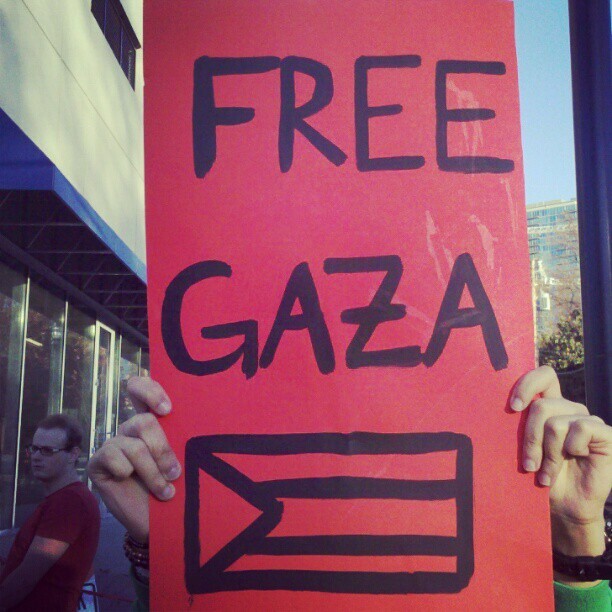 Learn more about AFSC's response to the crisis in Gaza. AFSC staff member, Gaza: “Every night is a nightmare. The deaths of very little children, just months old - just a few years old, are especially shocking. These are miserable times. I try to keep in touch with all the staff each day. Last night there was an airstrike against the neighborhood where my colleague Ibrahim lives. 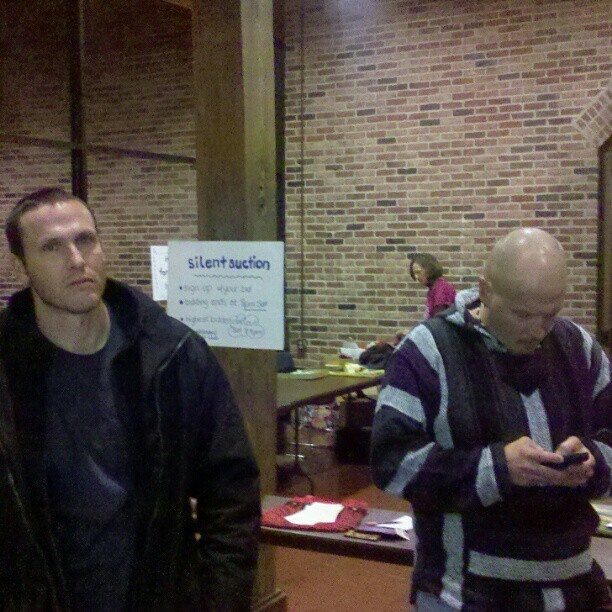 They were evacuated by the Red Cross in the middle of the night. I am worried about Rana with her four small children. Why should children pay such a heavy price? AFSC staff member, Gaza: “My children have become experts in distinguishing the sounds of the explosions whether the sound emanates from an F16, a rocket, or a missile. Abdullah - my 2-year-old - who still cannot talk properly automatically steers himself to the safe area in our house when he hears an explosion. It is so sad to see this behavior among my four children instead of being surrounded with their happy sounds. I am hopeful for a cease-fire, this shimmer of hope helps me move on another day”. AFSC staff member, 31 years old, Gaza: “It was a tough night, in the wake of a potential ceasefire agreement, with intensive shelling. I have high morale given that I have had similar experiences here upon my return from the Emirates in 1995. My wife though received a special kind of welcome upon her arrival to the Strip for our wedding ten days ago. She has lived abroad all her life and is finding it difficult, but with God’s will we will make it. God will help us through!”. Former Palestinian Youth Program Coach, 19 years old, Gaza: “I am still alive!, that was my answer to my 22-yeard old brother’s frantic knock on the bathroom door, just after a missile struck nearby, while I was taking a shower. We had to seek refuge at my grandfather’s. Our house, which sits in front of our large vineyard, was in the line of fire. Three missiles struck the vineyard, and we had to flee. Everybody is in danger, and I can no longer understand what is happening. I am the youngest in the household, my mother who is a psycho-social worker, tries to boost my morale, but I have already lost a brother in the past, and now everything seems so trivial to me. I no longer care about the house, or the oranges, or the vegetables, I just want to be safe with my other brother, mother and father and live in peace”. AFSC staff member, 27 years old, Gaza: “My eleven-month baby sprints and shivers every time he hears an explosion. My wife tries to put some cotton in his ears to minimize the impact of the sound, but he finds this uncomfortable. I stocked my house with baby supplies as soon as I heard about the Jafari attack on Wednesday, but the question is how long will this last? We are in a state of eternal waiting. We sit all together in one room in the middle of the house to protect ourselves in case of a missile, God forbid. We have no shelters, no bunkers and no safe protected area. It takes Israelis 90 seconds to seek shelter and takes us long hours to dig out the corpses from the rubble. This time there is no distinction between civilians and combatants, we are all targeted… there is no distinction”. AFSC staff member, 32 years old, Gaza: “My father sought refuge in Gaza after being forced to leave Majdal in 1948. He was only 12 years old when he accompanied his parents to what was thought to be a safer place. Today, we have to go to a funeral at my cousins’ who lost his twins and other members of his family. It is very sad. I live in my family’s home together with my five brothers, their wives, and offspring. You are talking about moving a human mass of 30 children towards the stairway every time an explosion is heard in the vicinity. The Islamic National Bank, targeted this morning is 500 meters away from our home, and 150 meters from the AFSC office. Every day the series of explosions begins at 6:00 pm and escalates until 6:00 am at which time we try to steal some hours of sleep. No one is exempt from this terrifying experience”. 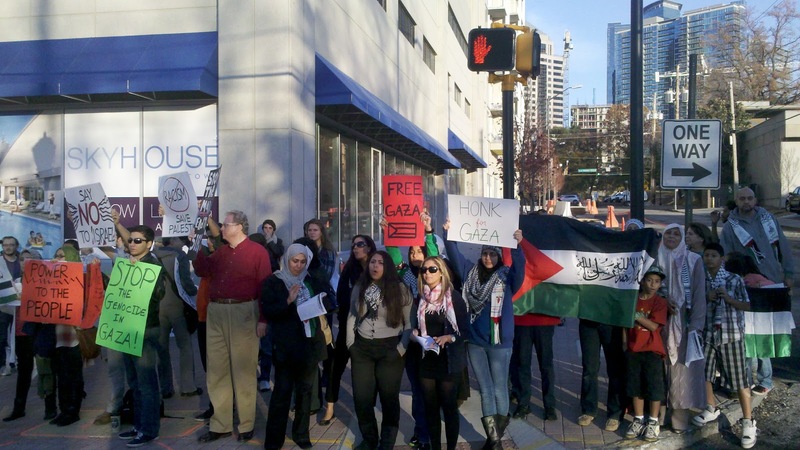 Today about 150 Atlantans crowded outside the Israeli consulate on spring street to call for an end to the assault and ongoing siege on Gaza. Though an overwhelming amount of media air time has been devoted to the plight of Israeli's living in fear of a Palestinian attack, there are some realities on the ground that are just not being reported in the US mainstream media. 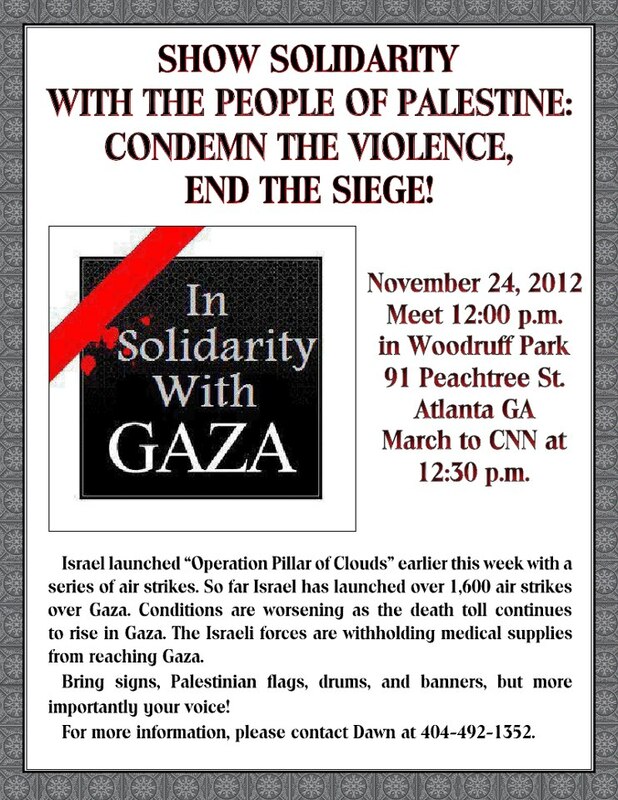 It must first be articulated that Gaza is by far the world largest open air prison. Gaza has been under siege for years, denied most of their basic human needs by a military superpower that has openly restricted food from men, women, and children. 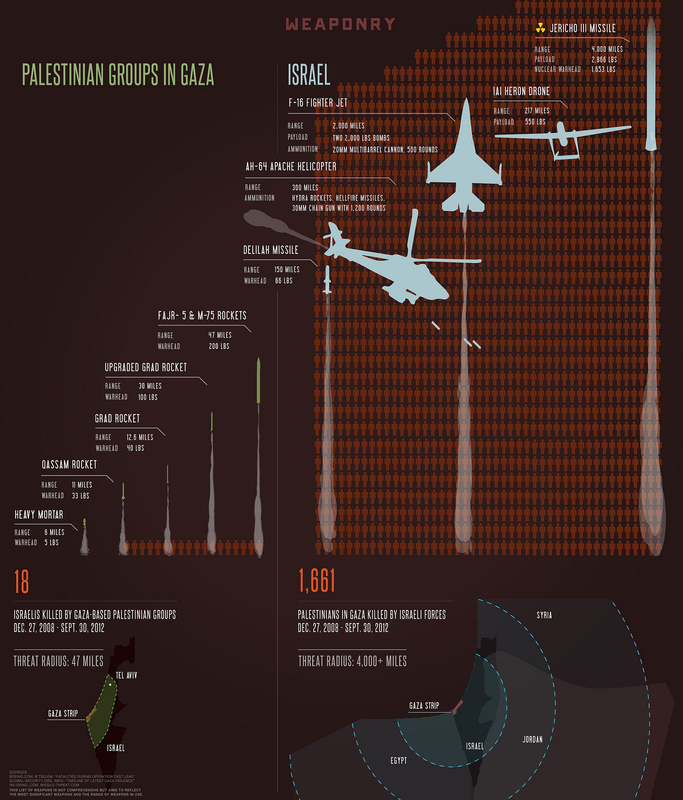 There have been over 130 Gaza fatalities and 5 Israeli deaths. All of these are tragedies It's also a tragedy that by listening to US mainstream media one would believe that Israeli live are for more important then Palestinians. It has been said that there can be no objectivity in the context of clear oppression. It is difficult to take anyone seriously that truly takes in all the facts on the ground in Israel and Palestine and believes the PR coming out of Israel right now, it is a nation that has truly lost credibility. We are grateful to know so many amazing Israeli's here in Atlanta that stand against the actions of Israel, in fact many of those folks joined us in the streets today. It really must be noted that every bomb being dropped on Gaza is sponsored by the US in more ways then one. The F16's that drop many of those bombs are made in Marietta, and subsidized with US tax dollars. 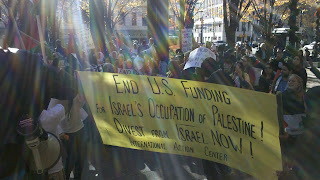 The United States gives about 10 million dollars a day to Israel in military aid. The US also blocks UN resolutions aimed at confronting Israel for what the rest of the world sees as aggressive human rights violations and war crimes towards Palestinians. There was a time in this country when the US government claimed that all native American's were savage sub humans, and they posed a threat to our survival. History of course remembers us as the genocidal savages. 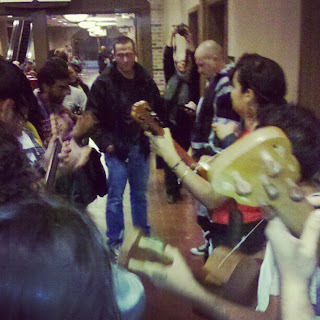 In one of the most dramatic moments at this year's School of the Americas Watch rally/vigil in Columbus Georgia, political hip hop group Rebel Diaz called out a group of eight undercover law enforcement officers at the Columbus Convention Center Saturday night while workshops, info shares, and other SOAW related activities where going down. Members of the group recognized several of the officers from pictures taken over the last few years. The officers where checking out the Killer Coke campaign table when Rebel Diaz tapped one of them on the shoulder and asked what organization they were with. The group had no response. The Rebel Diaz crew then called out the group as being undercover cops, and snooping on human rights activists. At first they stood there looking confused as a large crowd began to surround them. It was clear that the officers had attempted, poorly attempted, to blend in with the crowd. 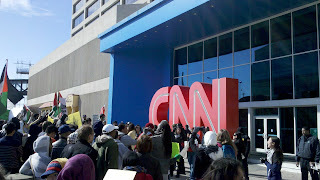 One of them was even wearing a pro-marijuana shirt. Finally the officer who appeared to be in charge admitted that they were in fact undercover cops who where assigned to run surveillance on the movement. Clearly the officers had been collecting information about all the various groups giving workshops and tabling at this years action. Things got heated for a moment and nobody knew for sure what was going to happen next. The officers stood together, projecting a fairly cavalier attitude. What happened next was just pure joy. From around the corner, almost out of nowhere this beautiful group of young mariachi performers surrounded the cops and stared playing and dancing ensued, they were joined moments later by a puppet who danced around the cops. The tough cavalier attitude of the officers quickly transformed into confusion at first, and then what appeared to be shame. One officer actually seemed to be on the verge of tears. What started out as a potentially scary situation was transformed into a beautiful moment. SOAW dominated the situation, while officers where forced out of the shadows. The officers where then corralled into the Killer Coke campaign's workshop where they were treated to a film screening about Coca Cola's human rights violations in Columbia, after which they left the convention center. 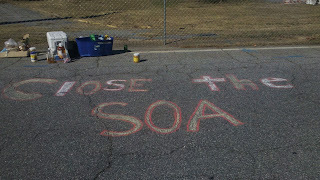 Despite the number of people traveling to Columbus Georgia decreasing each year the SOAW movement has had a number of exciting developments the year. In September the Nicaraguan government decided to pull out of the school for good after meeting with SOAW organizers. Nicaragua joins Ecuador, Argentina, Uruguay, Venezuela, and Bolivia in it's decision to terminate it's relationship with SOA/WHINSEC. This represents a major victory for the SOAW movement and a payoff for the movements new focus over the past ten years to put more energy into developing relationships with Latin America and less energy into developing the mass mobilization in Columbus Georgia. SOAW also just had a sit down with the Obama administration. 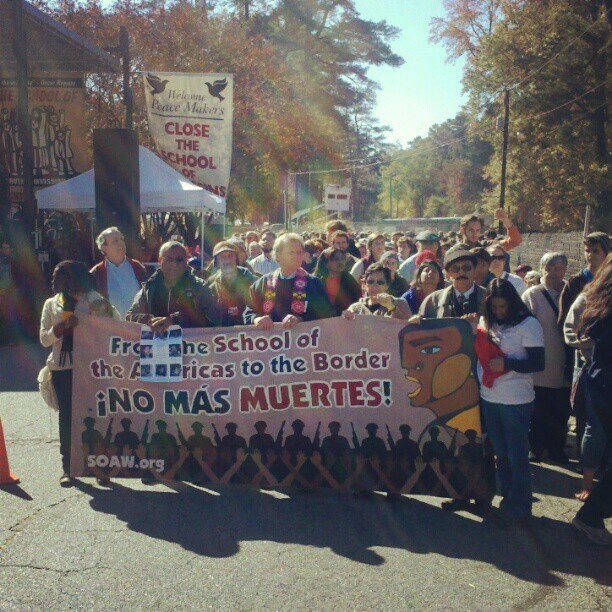 As of now there are 69 members of congress urging Obama to close the school. Here's a link to an excellent report back on that meeting. The rally and vigil at the gates was still very powerful this year, with over 2,000 people coming from around the country. This years vigil was a great opportunity to build networks between organizers across a wide variety of issues in person, which is a rare opportunity. The November vigil is maybe the only space I know that brings progressive/ radical people of faith, college organizes, organized labor, pro-immigrant groups, antiwar orgs, anti-racism movements together on this scale. 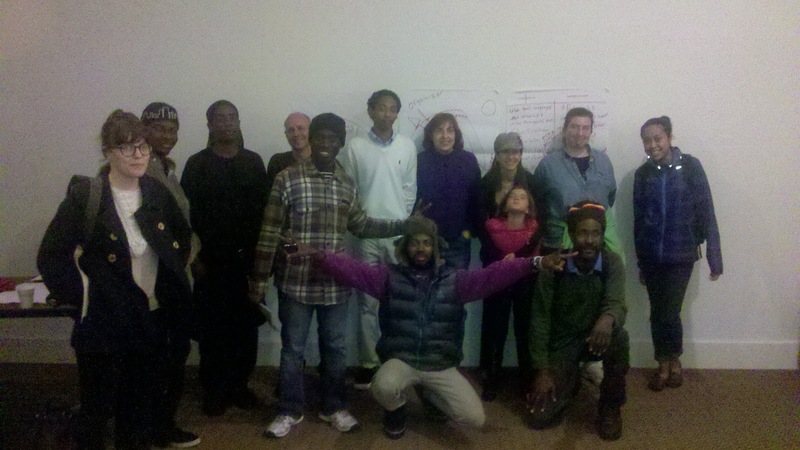 This year brought a new layer of folks organizing around housing as well. Georgia Peace and Justice Coalition hosted it's annual Georgia Activist meet-up, which brought folks together from Columbus, Augusta, Valdosta, Atlanta, and Marietta. The yearly gathering produced that same kind of cross pollination opportunities that the overall gathering provides on a national level. This year's rally/vigil also attacked several undercover law enforcement personal, which I've decided to write about in another post. American Friends Service Committee facilitated a housing justice workshop Friday night, which was attended by over 100 people. The attack, code named “Pillar of Defense”, began 14 November with the assassination of Hamas’ Gaza Military Commander Ahmed Jabari and coordinated attacks on 20 alleged Hamas targets throughout Gaza. 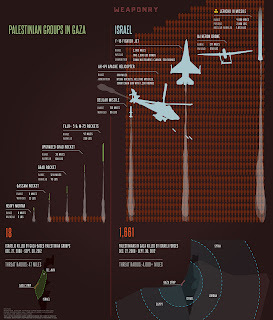 These attacks have been followed by the continued shelling and bombardment of Gaza from the air, land, and sea. Gaza is home to 1.6 million Palestinians of whom fifty per cent are children under the age of 18. There have already been over ten Palestinians killed, including young children, as a result of the attack. As violence usually leads to violence, Palestinians have retaliated resulting in Israeli deaths and injuries. The number of dead and injured on both sides will continue to rise as the violence continues. It is likely that a great deal of attention will be paid to the question of who started the latest escalation. This attention will be misplaced: the roots of the current conflict are to be found in Israel’s ongoing occupation of the Gaza strip, its failure to recognize the results of the 2006 Palestinian elections, and the continued Gaza blockade. In both the short and long term, military escalation and violence will do nothing to make either Palestinian or Israeli civilians safer. Rather, they will likely increase suffering by civilians on both sides of the conflict. There are striking similarities between the current situation and the events that immediately preceded Israel’s “Operation Cast Lead” which began in December 2008 and during which over 1,400 Palestinians, including over 300 children, were killed. The world cannot sit by and allow a similar tragedy to occur. The US government and the international community must immediately pressure Israel to completely end its assault on Gaza. The US government has a particular responsibility to ensure that the nearly $4 billion it provides to Israel annually in military assistance is not misused and it therefore must do more than simply “monitor the situation”. Pressure to end the immediate violence should be complimented by a diplomatic offensive that targets both Israel and all Palestinian factions and that has as its goal ending the occupation and realizing a just peace. The only way to truly end the violence of the conflict is to end the occupation, respect international law, and ensure equal rights for all. Around 100 people come out tonight to light candles, pray, and talk about the impact Parkwood Farms has had on their lives. 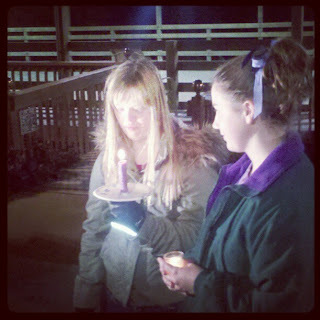 Though there were a lot of tears shed by children that benefit from the farm and their parents, but the feeling tonight was one of hope and conviction. Many of the children living with disabilities spoke at the vigil and several of them led chants like, "we will not be move", "save Parkwood" and "we aren't going anywhere"
That reality is that Parkwood Farms could be evicted at any moment. Why? Because the mortgage almost doubled often the Adjustable Mortgage Rate kicked in making payments for the all volunteer non-profit impossible. Dr. Peterson, who resides on the farm and runs it, has tried to negotiate with the bank for year to no avail. Our communities can't afford this type of disrespect. Parkwood was hit hard by the bank induced economic crash, yet they made a commitment to continue working with children whether they could pay or not because they car about their community. When far away investors and financial institutions turn our homes into ATM's this is what it looks like. We believe our communities are stronger when the folks that live in them are the ones calling the shots,and we may be closer to the reality then we think. 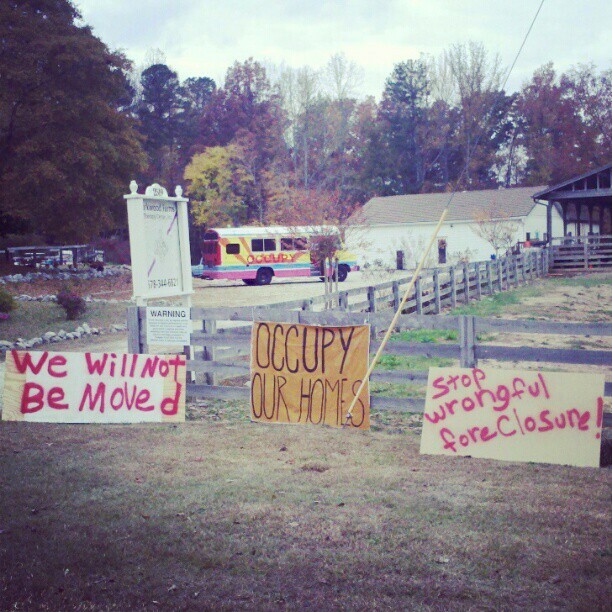 The folks at Parkwood Farms have already decided that their not leaving, the Farm is theirs, Not HSBC's, who owns the loan, or Everhomes, who services the loan. It would appear that their community feels the same way judging by the enormous support they've gotten the last few days. So far no bank is taking responsibility for Parkwoods eviction attempt or wrongful forclosure, and for good reason; who wants to look like a monster? The fact is that all eviction documents have HSBC's name on them, the lawyer that pushed for eviction did so on HSBC's behalf. The servicer of the loan, Everyhome, seems to be guilty of felony fraud on multiple levels, though it's almost a guarantee that the Judge that heard Parkwoods case(Judge Mitchum) would ignore felony crimes committed by banks because that's just how he rolls. Judges like Mitchum are actually a big part of the problem. It would appear that they would rather have countless boarded up homes in the districts they live in and get elected in, than to hold banks accountable for the mess they created, to hold then accountable to the law. 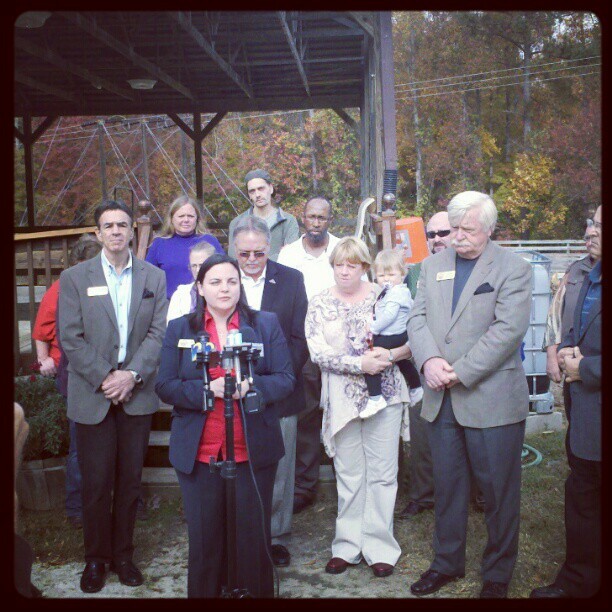 Sign the petition to Save Parkwood Farms. 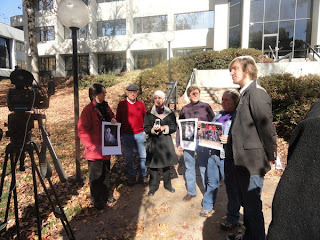 Today a delegation of struggling homeowners, led by JoSelf Freeman, went to the Bank of America branch closest to JoSelf's home in Fayetteville to deliver a simple message. Bank of America caught wind of our plans to stop by and decided to make the inside of their bank closed to all costumers, and they hired an armed guard to circle the building. We decided not to let that stop us. JoSelf led us right up to the door. We were greeted by an armed guard and the bank manager, who came outside to ask us what our business was. The bank manager informed us that there was a security situation. We let the manager know that we were not there to cause any harm to him or the other workers in the branch, that we knew they were low on the pay scale and had little decision making power. 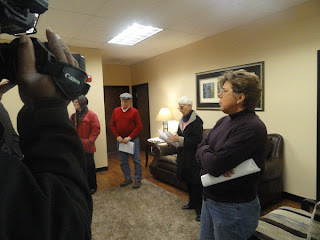 We were there to make sure the Higher ups at BofA knew that we were not going to sit back while they evicted a senior citizen who is loved and needed in his community. 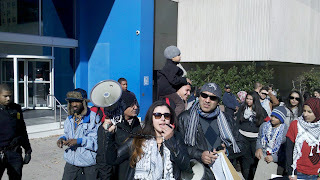 It seems that BofA is so frightened by us that the mere possibility of small delegation of us going to a branch to deliver a letter is cause to hire armed men and lock the doors. Seems like it would be a lot easier to just except a fair monthly payment from JoSelf. 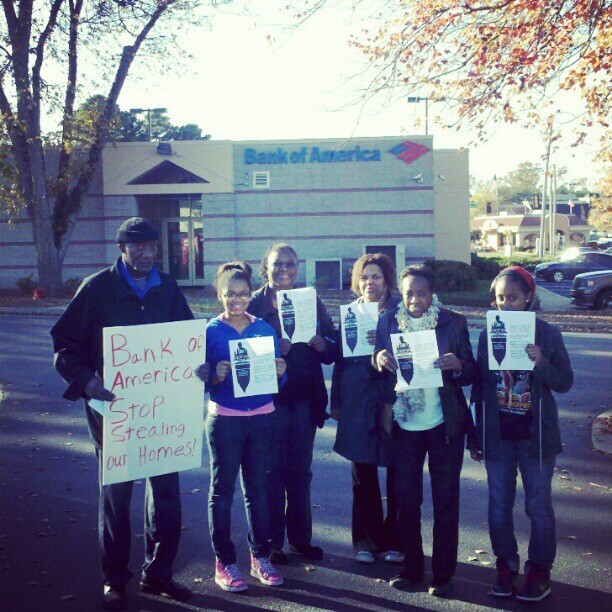 Call/email Ja'Nay Carswell with Bank of America  at : 877-471-4367 ext 225756 and ask her to rescind the foreclosure of JoSelf Freeman at 395 Highway 279, Fayetteville, Georgia 30214 and grant him the modification he needs to stay in his home. Georgia doesn’t need another boarded up house! Last night American Friends Service Committee facilitated an Atlanta Free School work shop on the basics of community organizing. Together we learned about tried and true effective activist strategies for organizing folks in your community to build the power we need to win. There is much wisdom to pick up from organizing tools of the past as we look to build the movements of the future. We eplored strategies for base building, developing appropriate targets, strategies to neutralize or move opposition, understanding the spectrum of allies and opponents and developing short and long term goals. We had a good mix of folks who want to get into activism or get involved with communities, causes, movements, newbie organizers, and experienced organizers looking to learn new info or brush up on their org skills. 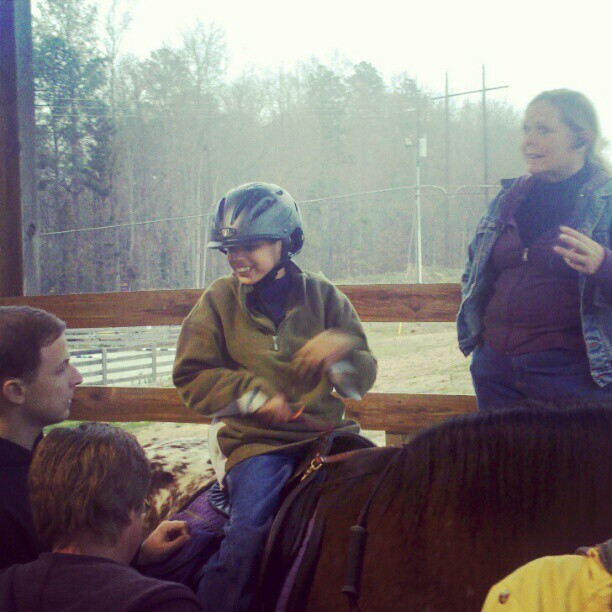 Parkwood Farms, a therapeutic riding center in Snellville for children with disabilities, is facing immediate eviction. Dr Marilyn Peterson, who owns the property and helps run Parkwood Farms, has issued a plea for support and a call to action to help save the riding center. The Sheriff's department arrived on Wednesday with the intention of evicting, although Dr. Peterson and the center had no notice of eviction. After the officer saw the children and all the horses he decided to reschedule. Dr. Peterson has decided to stay in the property and resist the taking of her land and the community has responded with support. Today Parkwood Farms,Occupy Our Homes Atlanta, American Friends Service Committee, the Mayor of Snellville, and the entire Snellville city council held a press conference and rally at the farm. 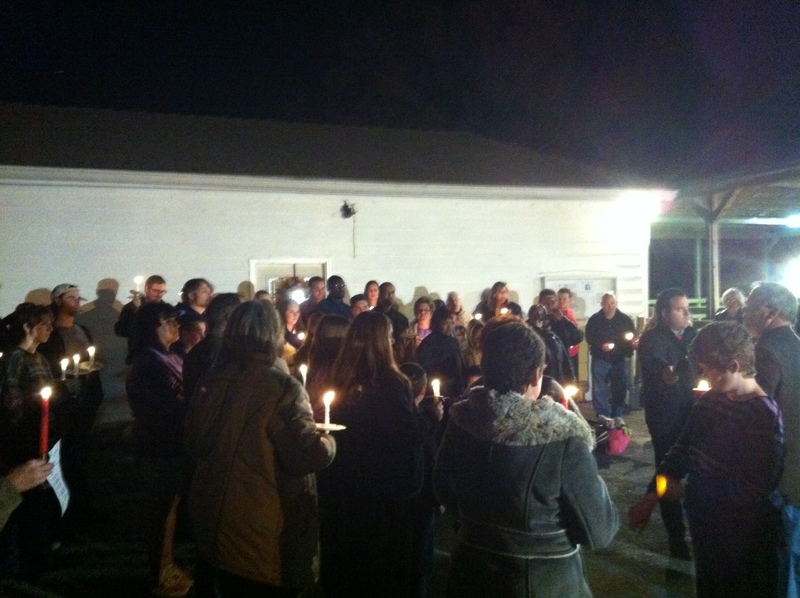 The message was clear; the community can't afford to lose Parkwood to HSBC Bank. “Parkwood Farms does great things for children facing physical, mental, or emotional challenges in their life.” Stated Snellville City Councilman Tom Witts. Councilman Witts was joined by the whole Snellville Council and Mayor Kelly Kautz who committed to stand behind Parkwood Farms and work to stop the eviction. Without the farm, she and her family have no income. 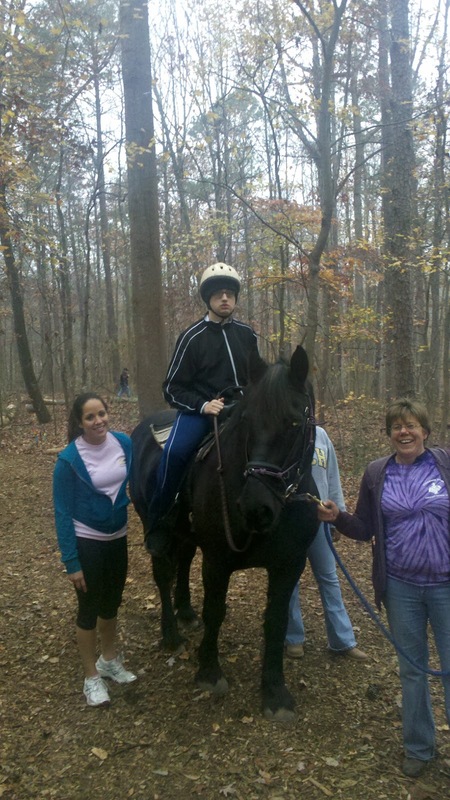 One of her sons is fully disabled, while another never leaves the house due to Asperger's. It was their disabilities that inspired Peterson to begin the therapeutic farm to begin with, eleven years ago. 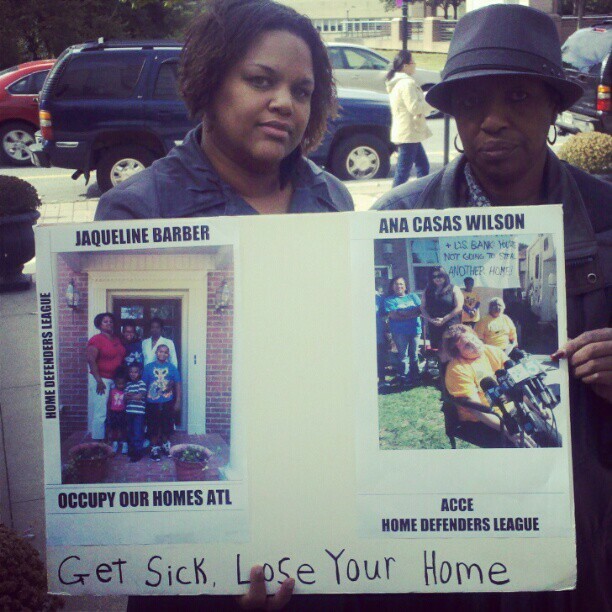 While the eviction came as a surprise, she has been fighting the banks for over two years now. Her case is in litigation right now in federal court.While Dr. Peterson has a very good case, it could be years before there's a decision on her case, years the Parkwood Farms doesn't have. Banks regularly prolongs these types of cases in hope that homeowners will give up or run out of money. Peterson received a predatory loan in 2004. When she refinanced it in 2011, she was told that the terms would be good for "the life of the loan." "What they didn't tell me was that the 'life of the loan' was only two years," she said. Everhome Mortgage Company in Jacksonville Fl services the loan for HSBC Bank and is aggressively moving forward with eviction. According to Peterson, the people handling her foreclosure say that "so many things are wrong with this that they are doing it pro bono." The contract, the way the proceedings were handled, and even the way she was given the loan are under federal investigation. 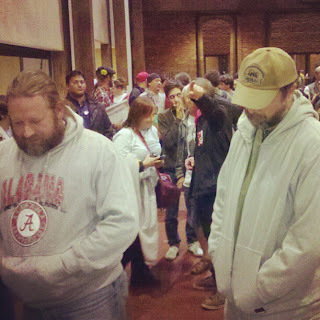 They're praying for a miracle. Of course over the years Veterans day has become a day to honor all who served in the military, a day to acknowledge the sacrifice their service represents. We’re all used to seeing Banks, politicians, and corporation give lip service veterans day by having shopping sales, thanking veterans on a tv commercial, or hanging sweatshop made flag in their place of business. Are the institutions of power truly grateful for veterans and their service to the country? Of course they are. 60% of the federal discretionary budget goes to the military industrial complex in one way or another. The products of war are big business, which means big profits. From oil, to reconstruction, weapons development, minerals, even boots and coffins mean money in the bank. What are institutions of power doing to honor those recruited to fight the wars that line their deep pockets? Not much. Veterans are always more likely to be unemployed then the average American. They are less likely to have a four year degree. 1/3 of all homeless people are veterans, many of them combat veterans. The housing crisis has hit veterans hard. 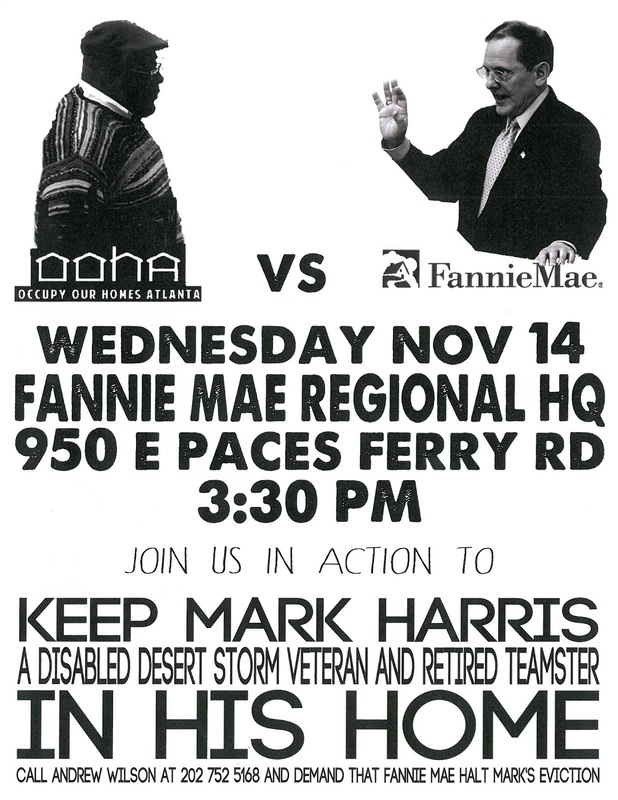 Right now we are especially disturbed by Fannie Mae’s attempt to take disabled Desert Storm Veteran Mark Harris home. Fannie Mae is 80% tax payer owned, and Mark has been struggling to work with Fannie Mae to strike a deal that keeps him from becoming another homeless combat veteran. 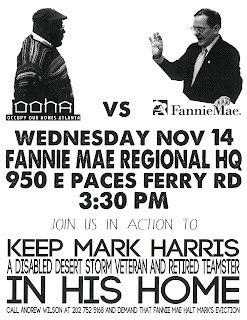 So far it seems like Fannie Mae plans to celebrate Veteran’s Day by moving forward with the eviction of Mark Harris. Will you celebrate Veterans Day with us by supporting Mark’s struggle to keep a roof over his head? There are three things you can do this week to help Mark. 2. Call/Email Fannie Mae and tell them to work with Mark to keep him in the home: Catherine "Candy" Lasher at 404-398-6901, catherine_lasher@fanniemae.com and call and/or Andrew Wilson at 202-752-5168,Andrew_j_wilson@fanniemae.com . 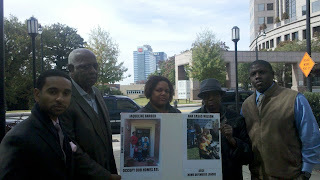 Demand that they halt the eviction of Disabled Desert Storm veteran Mark Harris at 1164 Dunwick Drive, Avondale Estates, Georgia. Disabled Desert Storm Vet Faces Eviction, Can You Help Stop It? Today disabled Desert Storm veteran and 20 year Teamster Mark Harris is in a courtroom getting his final eviction date set. His eviction date will likely be set for November 15th! Can you take a few moments today to help Mark keep a roof over his head? Your call could make all the difference! Andrew Wilson at 202-752-5168 Andrew_j_wilson@fanniemae.com . Demand that they halt the eviction of Disabled Desert Storm veteran Mark Harris at 1164 Dunwick Drive, Avondale Estates, Georgia. Negotiate a deal that keeps Mark in the home. Georgia doesn't need another empty house, Georgia doesn't need another homeless veteran. In 2005 I started my own trucking business, and then the economy crashed. I got illnesses related to my time in Desert Storm, and I fell behind on my mortgage. I’ve been trying to catch up ever since; recently I’ve applied for the HomeSafe program here in Georgia. While my application was being processed my VA benefits kicked in, which meant I could afford to make my payments. 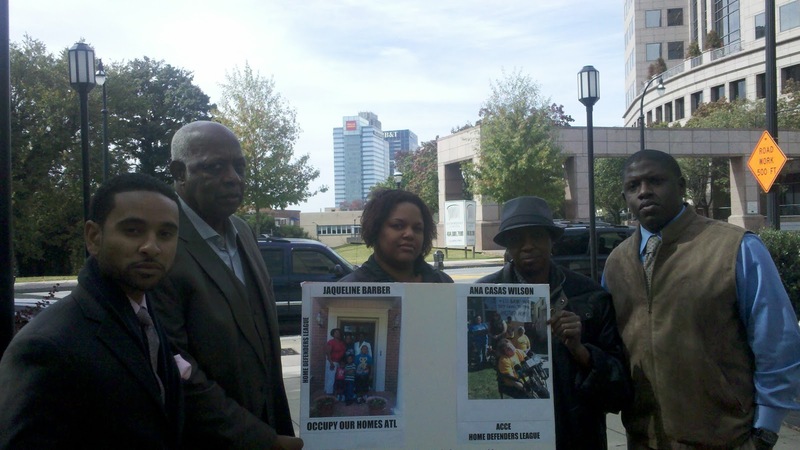 Fannie Mae is aggressively moving forward with an eviction, and it could happen as soon as November 15th. As a veteran, I thought the toughest battles were behind me. I never thought I’d be struggling to keep a roof over my head. I fought for this country, so I know I have a right to fight for my home! 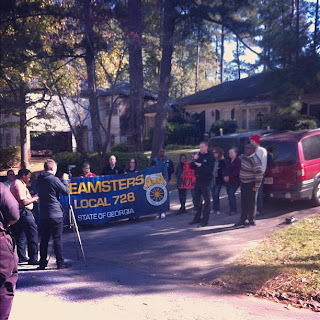 Yesterday Occupy Our Homes Atlanta, Atlanta Jobs with Justice, Teamsters Local 728, AFSC, and other supporters filled Mark Harris yard with a simple message to Fannie Mae, "We are not leaving, make a deal that keeps Mark in this house." Desert Storm veteran and retired UPS worker Mark Harris purchased his home in 1996 with a VA backed home loan and refinanced it in 2004. In 2005 he started a trucking business, and then the economy crashed. His illnesses related to his service in Desert Storm became an issue, and he fell behind on his mortgage. 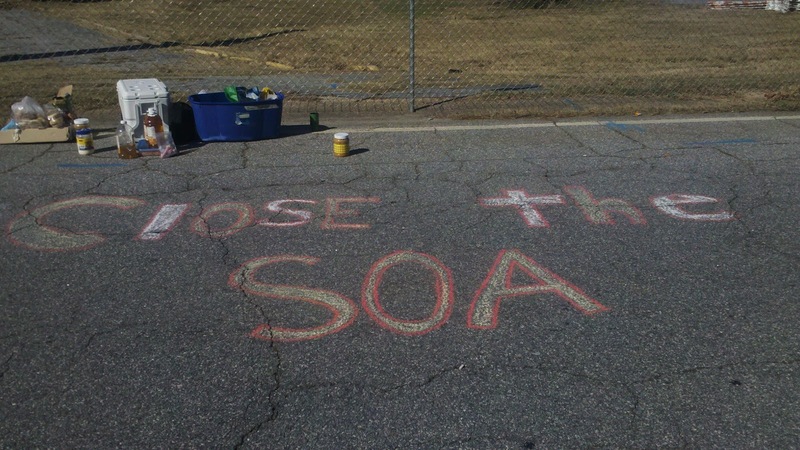 He’s been trying to catch up ever since; recently he applied for the HomeSafe program here in Georgia. While his application was being processed his VA benefits kicked in, which meant he could afford to make my payments. Greentree(loan servicer) and Fannie Mae(Loan owner) decided to foreclose despite Mark’s willingness and ability to pay. 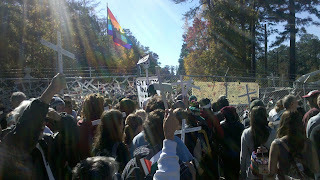 Occupy Our Homes Atlanta looked over the assignment documents and discovered that some of the country’s most famous robo signers signed the mortgage assignment that was used to foreclose on Mark. Mark was a proud active member of the Teamsters Local 728 for over 20 years. When Mark fell on hard times he reached out to his union brothers, and they responded. 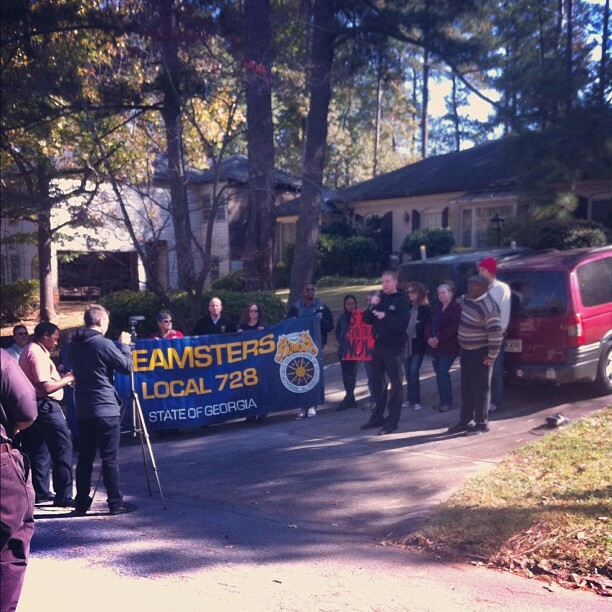 Both Occupy Our Homes Atlanta and Teamsters Local 728 are members of Atlanta Jobs With Justice, who has agreed to take on Mark's struggle understanding the relationship between housing justice and labor issues, “Unemployment is the number one contributor to foreclosures and evictions in Georgia. We need solutions that keep people like Mark in their homes, with access to good jobs, instead of putting more folks out of good jobs and their homes.” Said Atlanta JWJ organize Roger Sikes. At AFSC we believe that housing is a human right, and here in Atlanta there are more vacant homes then there are homeless people by 7 to 1. The word homeless and veteran should never be in the same sentence, yet anyone who works with the homeless population knows that veterans make by far the largest block of the homeless population. We urge Fannie Mae to do the right thing and keep Mark in the house, we know his community doesn't ned another empty house, and the streets of Atlanta don't need another homeless veteran. AFSC Plans to join other community members next Wednesday in direct action to support Mark Harris at Fannie Mae's South Eastern headquarters. We encourage folks to join us. Wells Fargo and US Bank are celebrating Breast Cancer Awareness Month by trying to evict cancer survivors from their homes. After retried APD detective and Cancer survivor Jacqueline Baber’s story hit the airwaves and newspapers other cancer survivors facing eviction across the country started reaching out to her, and had more than cancer and eviction in common. It seems there’s a trend emerging that links cancer, US Bank, and Wells Fargo. One of those is Ana Casas Wilson who has lived in the same home near Los Angeles for 40 years. In 2009, she was diagnosed with breast cancer, and her husband had to take some time off to care for her. Their income quickly rebounded, but they missed some mortgage payments. They tried to get back on track and work with the bank on modifications. Ana was born with cerebral palsy, and has been a passionate and effective advocate for the disabled. 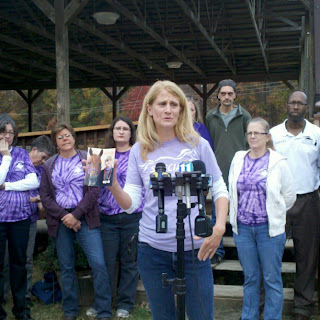 Wells Fargo foreclosed on her anyway, refusing to accept her payments. Jacqueline Barber spent 20 years on the Atlanta police force, only retiring when injured by a car while on duty. In 2009, the predatory loan on her home caused her payment to go up $1500, and she fought to stay current. Then she was diagnosed with bone marrow cancer and had to undergo aggressive treatment to save her life. She fought back against the disease, and spent months filling out forms and asking for modifications to her mortgage. A Wells Fargo Executive Vice President assured her they were working on her case. 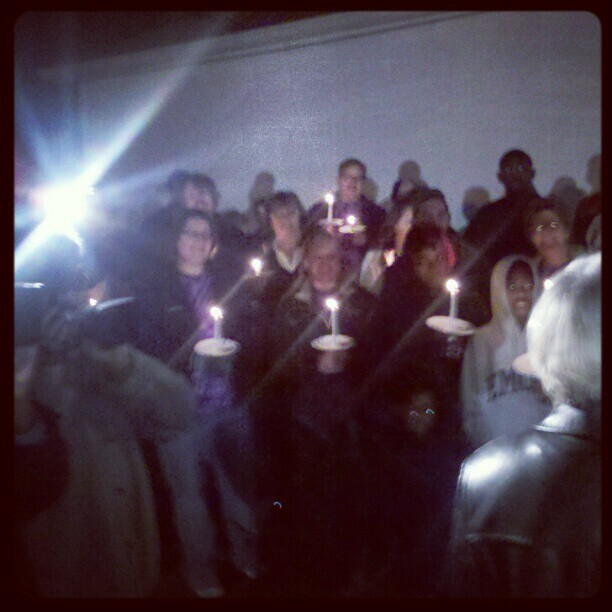 Instead, they sold her loan to US Bank at foreclosure auction, and now she's fighting imminent eviction. The banks are refusing even to sell the home to friends and family who have banded together to help Jacqueline. “While the banks do all this cancer awareness lip service with the pink ribbons they’re trying to evict cancer patients like me and Ana”, Said Jacqueline Barber. “In my case, if I had committed the fraud that US Bank did, I’d be in a federal jail. They do whatever they want and get away with it.” Jacqueline is now moving forward with a lawsuit against US Bank for wrongful foreclosure. “Foreclosure is a cancer of our communities; one way of curing it is to keep people in their homes by working with them through tough times.” Says Jacqueline’s attorney Joshua Davis, who’s filing a lawsuit on Jacqueline’s behalf this week. We're in the last week of Breast Cancer awareness month, but it seems like the only awareness Wall Street bankers have is of their foreclosure lists.